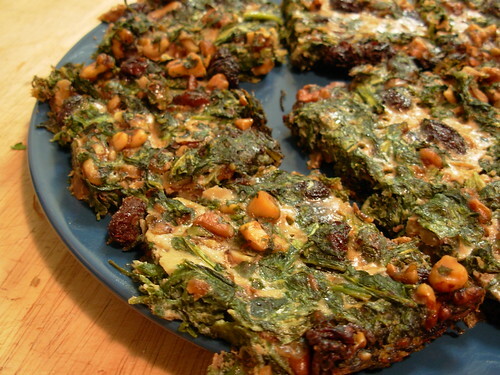 I was browsing Elana's Pantry the other day and came across this recipe for a spinach and pine nut cake: http://www.elanaspantry.com/cooked-veggies/community-supported-spinach-cake/ I thought it looked pretty fab so I set out to make my own using slightly different ingredients. Here is my result. 1. 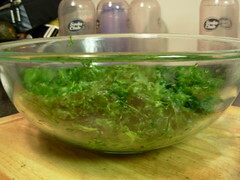 Wilt arugula in a large covered saucepan, over low heat (do not add water), until tender. 2. Drain and cool, then gently squeeze moisture out of the arugula. Really, get all the moisture out you possibly can. I think this is the most important step. 3. Place arugula in food processor and pulse until coarsely blended, then set aside. 4. In a small skillet, warm 3 tablespoons oil, add walnuts and saute until golden brown. 5. Add garlic to pan of walnuts and saute together an additional minute. 6. In a large bowl, combine walnut mixture, blended arugula, eggs, raisins and salt. 7. Spread mixture in a very thin layer into a greased 7 x 11 inch pyrex baking dish. 8. Bake at 350° for 30-40 minutes. 9. Cut into 9 squares and serve. I was home alone when I made these and I ate half the pan by myself right away they were so good! The raisins make them very sweet, so I think if I made it again I might reduce the raisins to 1/4 or 1/3 cup. This was great as a side dish with some steak. It was also good room temperature the next day for breakfast alongside some fried eggs. I roasted a whole chicken and the hubby and I ate the breasts and wings with all the yummy crispy skin, which left us the leg quarters as leftovers. Now, I'm always stymied when it comes to leftover dark meat. I like chicken legs when they're still hot, but when you use them for leftovers in the old standards (chicken salad, fajitas, soup) they have a texture I find unappealing. 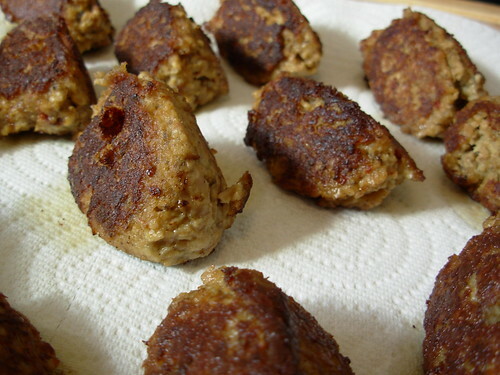 I was flipping through some old cookbooks and I found a recipe for cooked chicken called chicken croquettes, which are basically meatballs made with cooked chicken meat. Perfect for my texture problems! The only problem is that traditional croquettes are held together with bechemal sauce (flour, butter, and milk/cream) and bread crumbs, and the outsides are usually breaded as well. I was undeterred and decided to come up with a paleo version. Now, I've never had a real croquette so I don't know how my version compares to the "real" one, but I thought these were pretty darn tasty. I spiced mine up with some Southwestern seasonings, but these are unnecessary to the overall dish. Start these a few hours or the day before you want to eat as the mixture needs to chill in the fridge. Makes approximately 12 croquettes. Pulse the onion and mushroom in a food processor until very finely chopped. These are standing in for your bread crumbs. Heat up a little olive oil in a skillet and gently saute the mushroom/onion mixture until it is cooked through and starting to brown. Meanwhile, put the cooked chicken meat in the food processor and pulse until it starts to kind of look like bread crumbs. Add the mayonnaise, chipotle pepper, adobo seasoning, and egg and pulse to combine. Add the cooked onion/mushroom mixture and pulse to combine again. Scoop the chicken mixture into a container with a lid and refrigerate for 2 hours or overnight. When the time comes for cooking, heat some olive oil up in a skillet. Using two spoons, scoop up the chicken mixture and shape it into quenelles. Don't know what I'm talking about? Here's a link that explains how to make a quenelle: http://www.chefspencil.com/recipes/NDUy/QuenellesHowTo.aspx Why do I do it this way? Well, three reasons. The first one is that I don't have to get my hands dirty. The second is that it looks really nice. And the third is that it makes it very easy to brown the meatballs evenly on three sides. Anyway, just brown your croquettes/quenelles on all three sides and set on a paper towel lined plate to drain. Enjoy! Once again I've been remiss in my blogging! My mom and little brother came down for a visit over President's Day weekend and they threw me completely out of my groove. That's ok, family wins out over groove any day! Anyway, the cooking has not stopped completely in the past week or so, so I'll dish out another bullet list of stuff we've been eating around here. Maybe I'll make this a regular thing! Scotch eggs - Well, it's just me eating these. My husband wouldn't eat an egg if you paid him $20. Basically you hardboil some eggs and then encase them in raw sausage meat. Then you bake them in the oven until the sausage is cooked through. I grab two for a quick breakfast or lunch. Shepherd's pie - Traditional shepherd's pie has a mashed potato crust. I made my crust with rutabaga and turnip and also added in some roasted garlic cloves. Yum yum. Sautee your veggies in a pan (onions, celery, carrots are good choices) and then deglaze with beef stock or red wine. Add in some ground meat and brown. Add some herbs for flavor (sage is good) arrowroot if you want a thick gravy. Top with your mashed root veggies and bake until bubbly! Fruit crumble - As previously blogged here. This week's had blueberries, apples, and frozen strawberries. Topping was pecans, almonds, prunes, and a splash of pomegranate juice. I don't have any structured recipe posts for you after the flurry of last week, so I thought I'd just write about the dribs and drabs of what we've been eating lately. Hopefully it can inspire someone! Turkey Soup: Remember the big pot of collards I made last week? Well I took the leftover cooking liquid and simmered some chopped up vegetables (2 teeny tiny potatoes, carrots, celery, and okra) until tender and then added in all the turkey meat I shredded off the wing that also had cooked with the collards. I added some parsley too. It made a really nice soup that we've been having a cup of with dinner for the past few days. Also on the plate are a simple carrot salad (shredded carrots with parsley and olive oil vinaigrette) and some braised mustard greens with shallots, white wine, and celery. 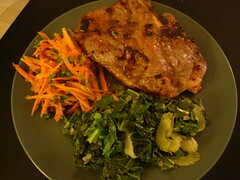 Skirt Steak with Beer: This one isn't technically paleo, but it was pretty awesome. If you're going to be unpaleo, this is the way to do it. I marinated skirt steak for 24 hours in a mix of wheat-free soy sauce, rosemary, garlic, mustard, worcestershire sauce, black pepper, and dark lager beer (thus negating the wheat-free soy sauce but oh well). Sear it to death in a skillet so it has a nice crust but is medium rare in the center. Yum yum. I think we had it with the turkey soup and a raw fennel salad. Pork Breakfast Sausage: I finally got around to making sausage for my husband to take to work so he's not eating all the crap that is in the breakfast meat available at his office. It's just ground pork with various seasonings that make it taste like sausage (key ingredient: sage). It's really good. I'll do a proper write-up on it soon. We've been having that for breakfast this week along with blueberries and walnuts. Apple Fritter Things: I have these in the oven right now and I'm not sure how they're going to turn out. It's shredded apples held together with ground flax seeds and an egg and flavored with lemon zest/juice and cinnamon. You bake them first and then turn the oven heat really low to kind of dehydrate them. They're still in the oven right now. If they turn out any good I'll post the recipe this week. That's it for tonight. Happy eating! We've finally come to the end of my week of greens! I'm ending the week with a collard greens recipe that goes against every cooking instinct in my body. In general, I like to cook vegetables for a short amount of time in a shallow skillet with a minimum of liquid; these collards are cooked for a long time in a big pot of boiling water! The result is tender, smokey greens that go perfectly with Southern staples like BBQ. We had these tonight with BBQ beef brisket. In a stock pot, heat the water to boiling with the salt, garlic powder, black pepper, cajun seasoning, and hot sauce. Add the turkey wing, lower to a simmer, and cook for 1 hour. 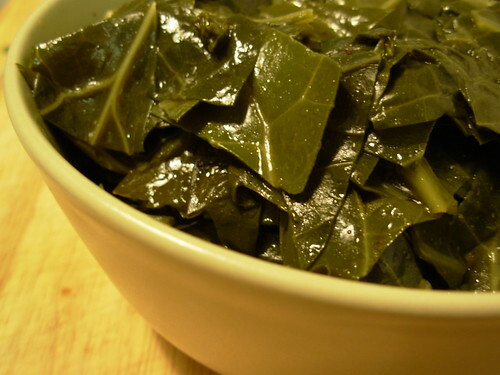 Meanwhile, prepare the collards. De-rib the collards by folding the leaves in half and cutting along the rib. Stack the leaves and cut them into strips, then roughly chop them. Add the collards to the pot along with the 1 T of olive oil or bacon grease. Simmer for a further 45-60 minutes. To serve, scoop the greens out with a slotted spoon. 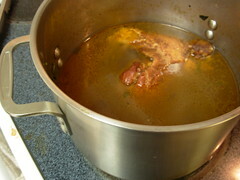 You should be left with a pot full of flavorful broth called "pot likker" and a well-cooked turkey wing. You can shred the meat and save the meat and broth to make soup later. I'm eyeing up my leftovers to make a turkey and okra stew. This is another rather unusual way to make kale. I used to make kale or collards several times a week and just braise them with a little garlic and chicken stock. I liked the greens cooked that way, but my husband got so sick of it after awhile that I had to find other ways to make them. This way is surprisingly delicious, different, and takes less than 5 minutes to cook! Preheat the broiler. 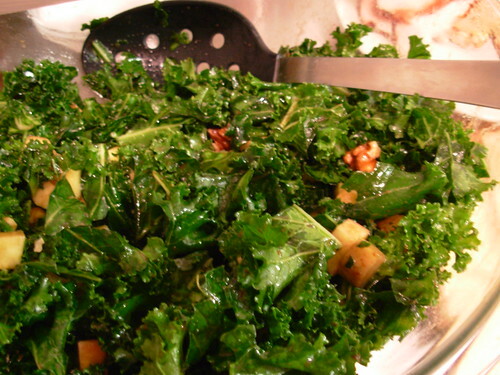 Remove the ribs from the kale and roughly chop it. 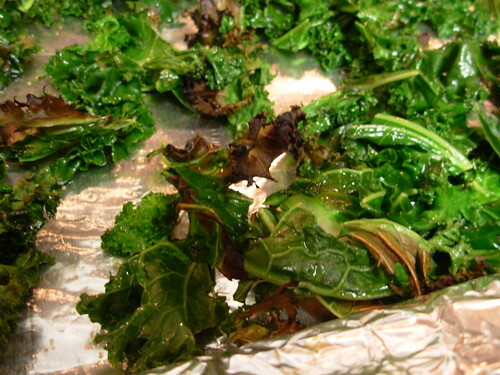 Line a large baking sheet with foil and spread the kale out. Drizzle with olive oil and season with salt and pepper. Put the kale under the broiler. Watch it the whole time! Don't take your eyes off it! When the edges just start to brown (this only takes a minute or two or three), take it out of the oven and give it a stir. Put it back under the broiler and watch it until it starts to brown again (just another minute). Take it out and serve. 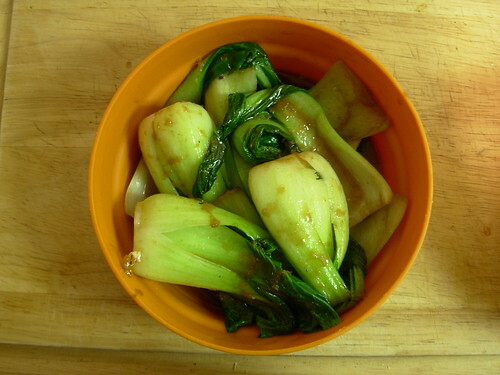 Cut 1/2 inch off the bottom of each bok choy bunch. Rinse the leaves under running water to remove grit, but don't pat dry; you need the water that is clinging to the leaves. Heat the oil in a large skillet or wok over high heat. Add the bok choy a handful at a time as it wilts down. When all the greens are in the skillet, add the ginger and salt or soy sauce. Cover and steam for 3-4 minutes. Remove the cover and let the liquid cook off. The technique for this recipe came from The Garden of Eating by Don Matesz and Rachel Albert-Matesz. I kind of like spinach, or at least I don't hate it, but I particularly dislike how mushy it gets when you cook it. Even just barely wilting it turns it too soft for my taste. 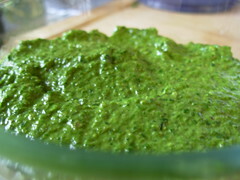 Turning it into a pesto sidesteps the whole mushiness issue and is a nice milder alternative to an all-basil pesto. You can use pesto in lots of ways; as a salad dressing (cold or warm), an alternative to mayo in chicken salad, a way to add some zest to soup, a sauce for steamed veggies. Tonight I'm making split chicken breasts and I'm rubbing the pesto underneath the chicken skin. 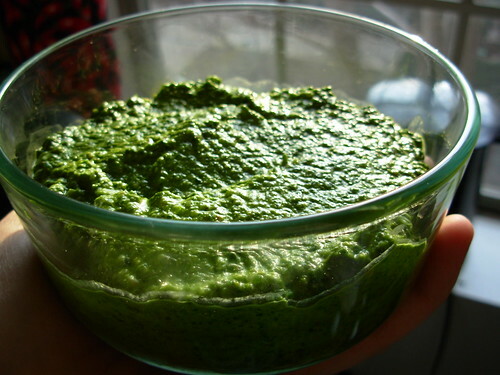 Place the spinach and basil in a food processor and process down to a coarse paste. Add the walnuts, garlic, and salt and process until the walnuts disappear. Scrape down the sides if necessary. With the motor running, add the olive oil in a thin stream. Taste it and adjust the salt level. Welcome to my first blog series! This week I am going to focus on greens. Greens are one of the most nutritious things you can eat, packed with vitamins and minerals and even protein and fiber. Everyone knows they should probably eat more of them, but it's hard when you only know one or two ways to prepare them. That is where this series comes in. Each day this week I'm going to prepare a different recipe for various green leafy things, exploring many different varieties as well as cooking techniques. First up we have an unusual raw kale preparation. 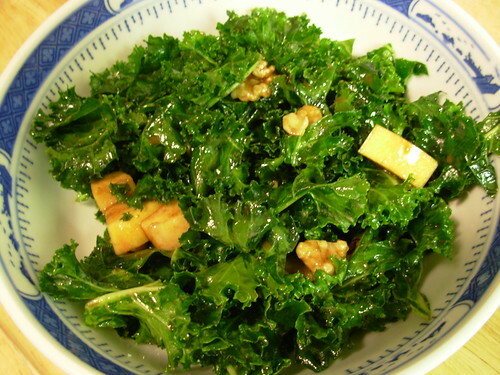 It's called "Relaxed" Kale Salad because the action of massaging the kale with a little salt and extra virgin olive oil wilts down the tough raw kale leaves significantly and makes them tender enough to eat without cooking. The original recipe can be found here: http://freshtopia.net/vlog/?p=97 There is a video about the salad at the link that is pretty cute. I usually use regular green curly kale in this, but I also like using red curly kale, which gives it a nice color. I've never tried using lacinato (dino) kale for this, so if you give that a try let me know how it works out! Remove the stems from the kale and give it a rough chop. 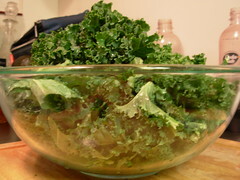 Put the kale in a large mixing bowl and drizzle with the olive oil and salt. Massage the kale with your hands for 5-7 minutes until it wilts down significantly and becomes tender. Roughly chop the apple and walnuts and add to the greens. Whisk all the dressing ingredients together and pour over the salad. Toss to distribute. You can eat it right away, but it will also keep in the fridge for at least a day or two. The kale is more than sturdy enough to hold the dressing for that long and the flavor can even improve with time. The only thing to watch out for if you want to hold it in the fridge is that the some of the apples can become a little mealy. I've enjoyed this salad immensely ever since I started making it two years ago. I hope you'll give it a try!